According to the 2010 Bureau of Labor Statistics(BLS), there are nearly 1.25 million people employed as grounds maintenance workers. Even better, the projected employment is expected to increase by another quarter of a million by 2020. What does that mean? That the BLS expects demand for grounds maintenance workers to increase by 20% - faster than the average for all occupations – tells you that there is definitely a market for new lawn maintenance businesses. The first step is to identify exactly what you want to accomplish with your new lawn maintenance business. Exactly why are you starting this lawn maintenance business? Do you want to work part-time? Full-time? Manage a team? How big do you want to grow? Are you prepared to manage the business aspects – invoicing, taxes, legal, sales and marketing? Also, what differentiates you from the competition? Do you have monetary goals for Year 1? How about Year 5? As you start defining your goals, start thinking about creating an internal mission statement that helps you clearly define who you are and why you’re creating this business. Your mission statement should be designed to help you give a purpose to your business. It may sound like a waste of time and a little bit too corporate, but every time you make a decision, you can look at your mission statement and ask “Am I living up to my mission?” And remember that, like the Constitution, your mission statement can be a living, modifiable document. Just for fun, Franklin Covey offers a Mission Statement builder that can help you start thinking about what’s important to you. Identifying your target market is based in part on your goals and mission statement. Are you targeting corporate office lawn maintenance? Are you going to maintain lawns in your neighborhood? 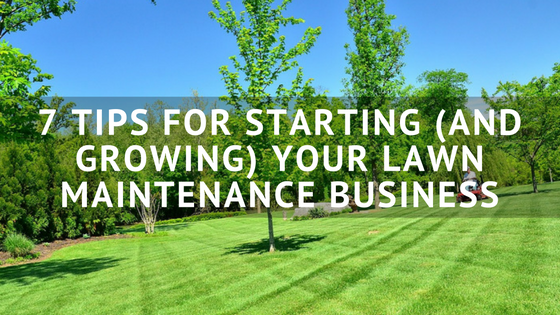 Are you going to open a chain of lawn maintenance businesses throughout the Midwest? If so, what niche are you looking to fill? Do you want to be the low-price leader like Wal-Mart? Do you want to go organic like Whole Foods? Your target market is just that – the people you plan to target with your marketing efforts. What does your ideal client look like? Many marketers choose to develop something called a buyer persona – a short paragraph or two – that provides a snapshot of what your ideal buyer looks like. HubSpot has a great post on questions to ask when developing personas. Developing a buyer persona can help you create targeted, effective marketing campaigns. You wouldn’t go to a gunfight without a gun, right? Once you’ve developed goals, a mission statement and identified who you’re selling to, it’s time to start buying the tools you need to run your business. So how do you choose? First, consider your goals and the types of services you plan to provide. Target equipment that is going to help you get things done faster (so you can do more jobs), professionally (so you provide a quality product) and that requires minimal maintenance (so you can limit the amount of time and money you spend on repairs and/or new equipment). Remember to think about total cost of ownership as opposed to the initial price. Just because a mower has a cheaper purchase price doesn’t mean it’s the best solution. So how do you choose equipment? The best advice is to network with your peers, talk to dealers and leverage the power of the Internet to get a feel for what equipment is best. Also think about what type of guarantee/warranty is included in the equipment, what kind of customer service the dealer has and how easy it is to obtain replacement parts. For example, our partner Go iLawn has a great solution that enables you to pay a couple dollars per property to get measurements, measurements you can then use to send a personalized price quote to potential customers without ever having to visit their property. It’s a real time – and money – saver that can help you quickly and easily build a customer base. Whatever route you take, make sure you act like a professional business. It’s worth spending some money on a basic website, a basic logo/brand and things like business cards, local advertising and giveaways like calendars/pens/sticky notes/magnets etc. These items can not only help build brand awareness, but also ensures your first impression is a positive one. We sell field service software, so this one is near and dear to our heart. You can’t improve your business if you don’t have metrics that you use to determine how your business is performing. We highly recommend that you invest in field service software – ours costs as little as $99/month – that can help you manage your client and prospect information, quickly and easily schedule jobs, seamlessly transmit to and collect data from the field, and automate your billing. But field service software like ours goes beyond improving your business workflow. It also allows you to collect data that can help you make smart business decisions. Are you quoting too little for a specific property because it takes longer than you initially thought? How many jobs per day can you perform? Can you route your crews more efficiently to save time and money? You can answer these questions – and many more – by analyzing the data your business naturally collects. We don’t care if you don’t choose our field service software solution. But we will if you don’t choose any solution – doing so is setting your business up to fail. 6. Build a Team You Can Trust. At some point – either initially or as your business grows – you’ll need to start putting together a team to help you run your business. Whether it’s a part-time office worker to manage your lawn maintenance business’ scheduling and billing or a full-time field technician, who you decide to hire can have enormous consequences. I recently was introduced to Marcus Sheridan (aka thesaleslion), who runs a pool installation business. As he posted in his blog, he was working his tail off to grow his business and relied heavily on an office worker to manage the financial aspects of his business. Unfortunately, she was embezzling money while at the same time not paying taxes. Not only did he lose a fortune, but he also nearly lost his business and personal assets to the IRS. Perform a background check – there are a number of companies like Verifications, Inc., HireRight, FirstAdvantage and Sterling – that can perform an in-depth check for $100 or less. Also, ask for references. There are great solutions like Net Reference and Checkster that automate the entire reference check process. And give you a good indication of how reliable an employee is. Spending a few dollars up-front can save your company a lot of money in the long run. Yesterday we talked about how those in the field service industry should use the marketing bulls eye approach to start their marketing efforts at their best customers. So should you. The most cost-effective way to grow a new business is through word of mouth. Don’t be afraid to ask customers to write a testimonial or even use social media like Twitter and Facebook to tell their friends about you. Most clients will take time to recommend you if they’re happy with your work and you ask them face-to-face. You can take it a step further by spending money to generate referrals. Hold a contest to see who can generate the most referrals and give them a gift (iPads or Android tablets are a great idea). Start a “Street Team” and send packages containing business cards, stickers, posters, etc. that your Street Team can give to their friends and family. Also, leverage the power of Angie’s List and other review sites to generate new business by giving a discount to clients that agree to give you a review. And remember to always track your activities to see which ones are most profitable so you can improve future marketing efforts. Clients vs. Customers – What’s the Difference to Your Field Service Business?